Every genuine vintage Cazal pair of glasses you can still find today goes back to a single designer: Cari Zalloni. He has designed all Cazal vintage glasses since 1975 and gave the company his name - CAZAL is made up of CAri ZALloni. Although the various Cazal eyewear series cannot be more different, they all have the unmistakable CAZAL character and a high recognition value. The Cazal 100 series were women's eyewear made of plastic. Often, a crystal-clear frame served as the basis for a surprisingly colorful design concept. 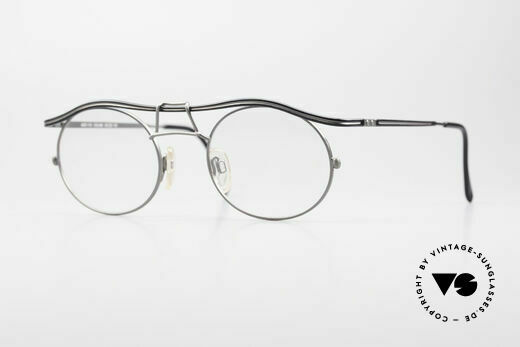 The 200 series from Cazal were metal glasses for women. Very often golden frames, which were painted by hand. The glasses of the Cazal 300 series were partly unisex glasses, partly women's glasses and also men's glasses. Here, Cari Zalloni not only played with the colors, but also combined materials such as plastic and metal. As not everything from even a designer legend necessarily leads to success, the 400 and 500 series are today rather unknown model series of Cazal. For example, the rimless Cazal glasses from the 400 series were probably a little too far ahead of their time. On the other hand, the Cazal 500 models of the "Crystal series" are more in demand today than ever before, as they are now very rarely found. This small series from the past is now regarded by Cazal connoisseurs as insider glasses. By far the most famous Cazal eyewear series is the 600 range. These Cazal glasses have achieved cult status. These include models 607, 616, 623, 642 and 643. These are men's eyewear made of formidably solid plastics. The Cazal 600 glasses partly have a frame profile thickness of 12mm. 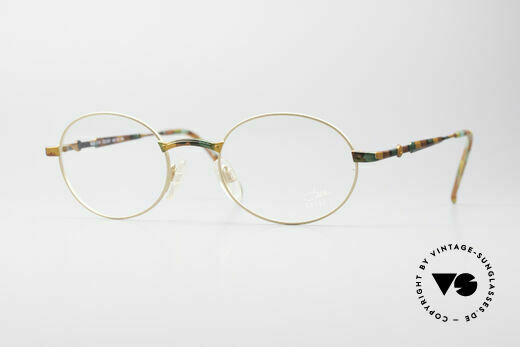 Especially in the American hip-hop scene, the old 600 vintage Cazals are revered. 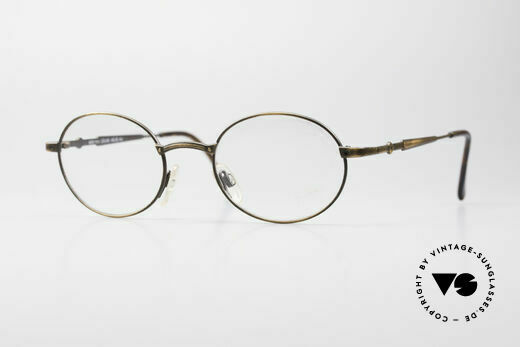 The men's glasses of the Cazal 700 series were just as successful, albeit with a different design. These were exclusively large, striking metal glasses. Probably the best-known Cazal 700 model is the "735", which Brad Pitt often wore. This brought Cazal's almost 30-year-old 700 series back into the public eye. Cari Zalloni not only created frames and prescription glasses, but also legendary vintage sunglasses. The Cazal 800 series, for example, consisting of unique ladies' and men's sunglasses, are made from colorful plastic elements. Some of these models are so brightly colorful and so exceptionally designed that they are real eye-catchers. These include the asymmetrical sunglasses models 858 and 867 as well as the extraordinary and rare "856 Rock'N'Rolla" Cazal. The metal sunglasses of the Cazal 900 series are as legendary as the Cazal 800 series sunglasses. The models 901 Targa, 902 Targa, 905, 951, 955, 958 and 968 were so successful that the company has started producing them again. With us, however, you’ll only find the old Cazal original glasses of the 70's, 80's and 90's by Cari Zalloni, which are often still imprinted with "Made in W. Germany". We do not sell Retro Cazals or modern Cazal retro glasses. In this way, we also try to honor the fabulous life's work of our friend Cari Zalloni, who unfortunately died in 2012. Cazal created its distinctive sunglasses style in the 80’s and quickly became famous for its extravaganza. Over and over, these legendary sunglasses can be seen in movies or music videos (especially Hip-Hop). We offer only the ‘old school’ Cazal original eyewear (often still ‘made in West Germany’). model of the first series by CAri ZALloni (CAZAL), ever! NO RETRO EYEWEAR, but 100% vintage stock !! NO RETRO specs, but a 30 years old original rarity! in remembrance of our friend CAri ZALloni (R.I.P.) !! worn by Big Boi from Outkast in the movie: "ATL"
this is the genuine 80's original and NO reproduction! 90's continuation of the legendary 600 series; vintage! this is really something completely different! best craftsmanship & 1st class comfort; true vintage! NO RETRO specs, but an old original from app. 1988! NO retro fashion, but original 80's commodity! unique design by Cari Zalloni - just 'old school'! unique design by Cari Zalloni - just 'old school' !! NO RETRO GLASSES, but a 30 years old rarity !! ultra rare gold/marbled-gray frame, precious & noble! NO retro eyeglasses; a rare 25 years old original! NO RETRO glasses, but a rare old 1990's ORIGINAL! great metalwork and overall craftmanship; Top! true eye-catcher in color: "havana demi blond"
a true eye-catcher in color: "blue-ochre crystal"
a true eye-catcher in color: "amber-moss green"
NO RETRO GLASSES, but a 25 years old ORIGINAL! great metalwork and overall craftsmanship; Top ! NO retro glasses, but a rare vintage 90's original! NO retro eyeglasses, but a 20 years old original! NO RETRO sunglasses, but a rare vintage original !! authentic Cazal HipHop shades - a vintage must have! unbelievable high-end quality.. You must feel this! this is really something completely different !!! great metalwork & interesting frame pattern, top! NO RETRO sunglasses, but the old Cazal orignal! a 'Must have' for all lovers of quality, fashion and design! great metalwork and overall craftmanship; durable!